Are you having a good time? Or if you’re reading this post-Christmas, did you have a good time? What did you get up to? Enjoying the holidays? Here I am, writing this at 5am, after getting up from bed to set up Santa’s Christmas presents for the children to find when they wake up. I’m still stuffed from last night’s party food. I also ate too much of the truly wicked Sticky Toffee Pudding that our neighbour brought around. It was sooo delicious, I had seconds & thirds. As the proof, my body weighs heavier I’m sure of it… They do say “a moment on the lips, a lifetime on the hips”… but I don’t have the ears to listen to that. Mind you, the good thing that came from this belt-loosening experience is that I have found the next item that I would want to sell at the market. Yes! Sticky Toffee Pudding! Yum! I’ve already got the recipe from our neighbour. 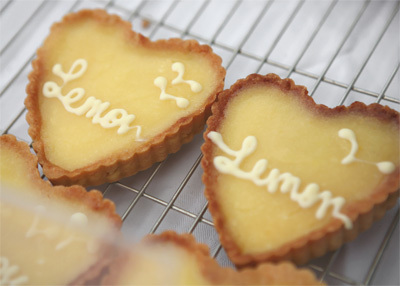 It’s a recipe by Simon Hopkinson, the acclaimed head chef of Bibendum in London. I’m gonna try it out, maybe change it here or there, & look in to how it is shaped, ie: is it baked individually in a pot? or shall I slice portions from a big cake, & so on. Anyway, right, off to bed again now! I’ll write about how my last two markets went next time alright? Just two market days left this year! 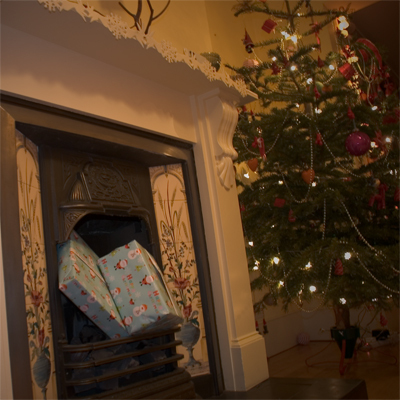 Quickie note to remind you that there are only two more Saturdays (13th & 20th) this year before the Christmas break! The market itself will be closed on the 27th, & then back to usual trading on the 3rd of January 2009. Although…, I’m thinking of not working throughout January, so if you wanna sample Coco&Me goods, make sure to visit me this side of the year!! Last Saturday, the Christmas season had finally begun (yay!) & the chocolate sales was marvelous (woo-hoo!) & the big 8-inch cakes sold pretty fast too (yesss)! – With that as the indication, I’ll be making loads & loads more the next two weeks. I’m hoping that it’ll be just as mad as last year’s Christmas rush (read about it by clicking here) when all the chocolates sold by mid-day! 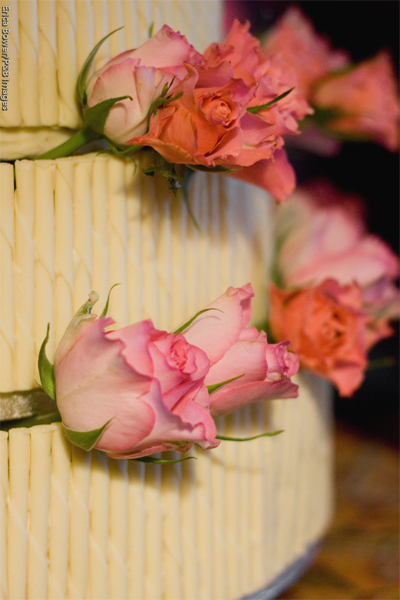 I’m sure to post more on this blog when I have more time after the 20th, so in the meantime, here’s a sneak preview of the picture of a Coco&Me wedding cake I’m hoping to write about. ‘Til then, ciao! I decided to do the market & also attend the Halloween party. To do so, I pretty much made the usual amount in just a day & a half instead of two, which is a silly attempt because I’m already at my limits, pushing myself hard to create as much as I can in the usual two full days. Y’see, every extra bit of chocolate & cake I can make & sell reflects on to my earnings. I have it in my head that, if I am to justify the time spent away from my children (at a time when they are the cutest & need me most), I want to earn as maximum as possible to make it worthwhile. I really felt more than tired… squishing my schedule like that, but…, my friend A’s party was superb (it really was Martha-esque!) – I’m glad we went. But… the stupid weather forecast who told me to expect interval drizzles that Saturday disappointed me again. It was a downright pour from lunchtime onwards. Come on weather-man, how wrong can you get every flipping time?! The chocolates & cakes didn’t sell well. Actually, to tell you the truth, I had to take home so much unsold stuff… I’d never-ever taken so much home, EVER. I felt so tired, so annoyed. So, if you ever want somewhere to go on a rainy Saturday, please come to the market & help me get these cakes a home to go to!! 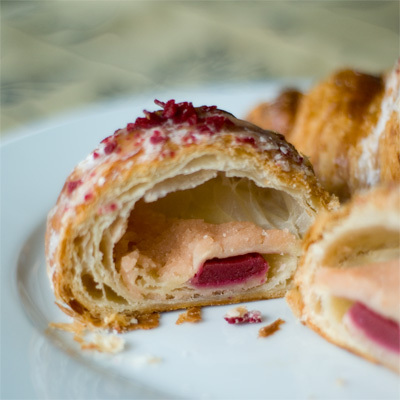 Last Tuesday I read on Dorie’s blog that Pierre Hermé sells croissants with Ispahan flavour. The picture she took of it looked sooo good, sooo drool-manufacturing, I decided to use my ‘wild-card’ & ask my Paris-residing brother to get it for me & bring it to London (I say ‘wild-card’ because I rarely want to ask him – the reason being, A, he is super-busy, & B, he is clueless about cakes!). “Ispahan” is Hermé’s signature flavour, composed of rose, litchi & raspberry (Apparently he came up with this now iconic flavour-combo back in his days as a executive chef at Ladurée – & that the patisserie retains the rights to sell them too). 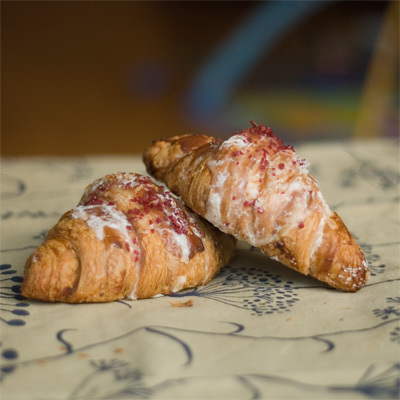 This croissant version has rose-flavoured almond cream with a couple of lichis studded inside, & has freeze-dried bits of raspberry scattered on top of the white icing. Unfortunately mine wasn’t with pink icing like Dorie’s… (I want cute-sy PINK P.H.!) But regardless of the icing-colour, the taste was superb, with a mixed sensation of buttery almond cream & pastry together with the tangy raspberry bits & fruity lichis that refreshes the palate. Humpf… Why can’t we buy beautiful croissants like these in London?! Or, even better, why doesn’t Pierre Hermé open a shop here in London?? 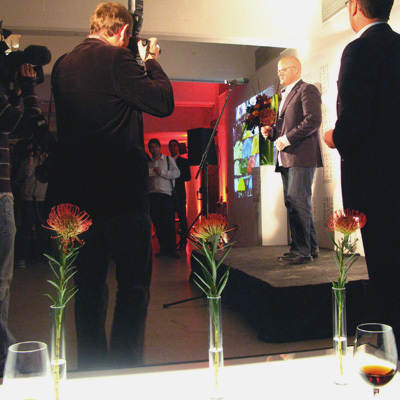 Last Monday I was invited to a Heston Blumenthal event held by The Sherry Institute of Spain. I spent the evening sipping five types of beautiful Sherry, nibbling on small but very tasty Heston canapés – all in the name of “finding the perfect food pairings with Sherry”. I was expecting a lecture-like situ, where we all sit down facing one direction. But instead, it was like a party. After an hour of drinking Palo Cortado Sherry (the best tasting one of the evening in my opinion), topped-up with more & more Sherry (bring it on waiter! ), Heston gave a speech for about five minutes, then one-by-one, different types of Sherry & suggested foods were handed to us with accompanying notes – for us to critique. Although me & my girl-pal “L” found it all a bit giggly, because the glasses & glasses of Sherry were an intoxicating 20% alcohol content, &, coupled with accompanied by “L” that I haven’t seen for a while, it became a rather merry evening! Oloroso – paired with – Smoked mackerel & coriander seeds rillettes. – The aroma notes of prune, hazelnut, molasses & figs balanced the smoky & oily flavour of the fish. Fino – paired with – Gruyere fondue & ground cloves. – The stone fruit element in the wine worked well with the cheese. Manzanilla – paired with – Crab with paprika on toasted country bread. – Unripe peaches & green apple aroma. Crisp acidity. Amontillado – paired with – Pata negra ham, peaches, balsamic vinegar, rocket & marcona almonds. – Woody & spicy aroma with balsamic note. Pale Cream – paired with – Scotch quails egg. – Nutty, meaty, smoky, fruity aromas. In all, the flavours of the foods were perfectly extended by the Sherry. We were very much impressed with it all, & were hmm-ing & ahh-ing with every one of them. Undoubtedly, eating a three Michelin starred Heston food (& in his presence) was exciting, & every plate was indeed “perfection”, just like his book title. The most notable by far was the scotch egg. Firstly, I looove scotch egg. And this one had quails egg which I dig more than chicken egg too. AND I don’t know HOW, but the egg was still “soft-boiled”, gorgeous yolk still oozing. Pork sausage meat juicy n’ bouncy. Ahhhh-mazing. So I guess you’re wondering what the purpose of the event was & how I got to be there. Well, it was all about debunking the myth that Sherry is only to be drank at Christmas, & that it can be enjoyed with simple dishes that can be made at home, all year round. – And indeed, it was a definite eye opener for me. I really enjoyed drinking it, & if you can handle the alcohol, why not have it with your dinner? Count me in to the ‘convinced’ vote. – As for why I was invited, they think food bloggers can spread the word just like journalists can. 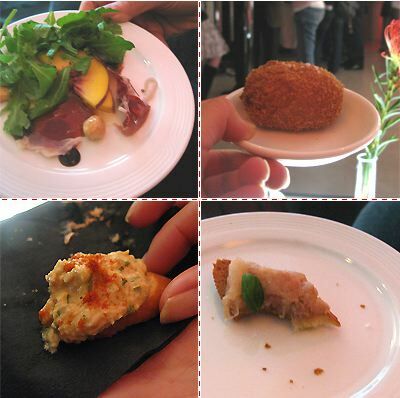 Well, if it’s a fab food event like this, please invite me again – please.